Rachel Beachy has been in love with her sister's boyfriend since she was a child. When her sister leaves the Amish faith, Rachel initiates a campaign to win Silas's heart. Can Silas set the pain of Anna's rejection aside and see Rachel as more than a child? Will Rachel ever know the true meaning of hope? 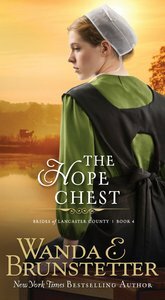 About "Hope Chest (#04 in Brides Of Lancaster County Series)"